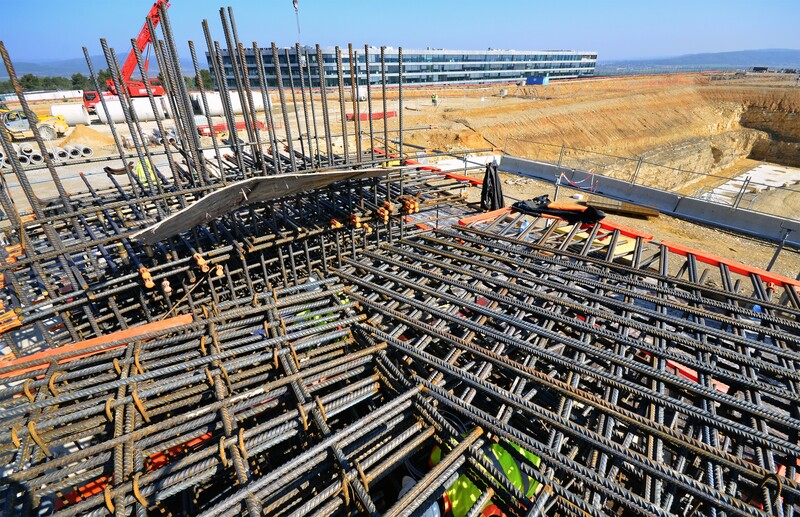 In order to have a hands-on experience of the difficulties that could be encountered in the creation of the B2 slab—the 1.5-metre-thick reinforced concrete 'floor' that will support the Tokamak Complex—a 150 m², 1:1 scale mockup is currently under construction on the ITER platform. Different rebar arrangements, presenting specific challenges, are being reproduced by the mockup. The rebar in this picture reproduces the interface zone between orthoradial (a grid of circles surrounding a point and lines starting from that point) and orthogonal (right-angled) arrangements. In the B2 slab, one fourth of the total rebar is arranged in an orthoradial manner (the central area of the Tokamak Complex); the rest is orthogonal. How these areas interface is critical to the B2 slab's robustness.